The final conference on 19.09.2018 in Dublin was a great event. There were at least 70 external guests representing many different help and support centres in the field of domestic violence as well as training providers and the police. The EMPROVE team is happy to invite you to the final conference in Dublin on 19.09.2018 hosted by our Irish partners Exchange House Ireland. The conference will give an insight in all the project activities and outcomes and will be a great opportunity to network with European partners, professionals and experts from the field. Two special guests are announced – both survivors of domestic violence – who had the courage to break the silence and talk about their domestic violence experience. Please find the agenda here. The EMPROVE team is currently in Germany (April 2018), reviewing the feedback from testing the EMPROVE innovative platform in six EU countries … the official public launch of the platform is approaching! The platform offers various missions to support women survivors of domestic violence to empower them by supporting them in reflecting on their strenghts and values. The platform is based on the theory of gamification and uses gamified elements aimed to engage the DV survivors in a long-term journey of empowerment. The platform combines solving different online or live missions and achievements, in addition to the face-to-face sessions with a counsellor, using also the power of the own self-confidence. The EMPROVE team and their external guests had an interesting training week in Girona, Spain, in November 2017, hosted by our Spanish partner Magenta. During the training week all training modules were presented by the respective authors and elements of these were tested with all participants. Subsequently, feedback was gathered in terms of their usability, relevance, user-friendliness and attractiveness. The partners took home a lot of very positive impressions and useful hints and tips on how to imrove the training materials. 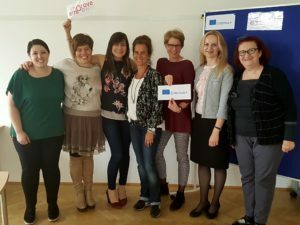 During our partner meeting in Vienna in May 2017 we brainstormed all relevant learning topics that should be part of our training addressing survivors of domestic violence who have left their violent partnership and who want to lead an independant life. The EMPROVE team is glad to announce the launch of its website. It will deliver updated information on the EMPROVE project activities and provides interesting materials for download. Please visit the website here.